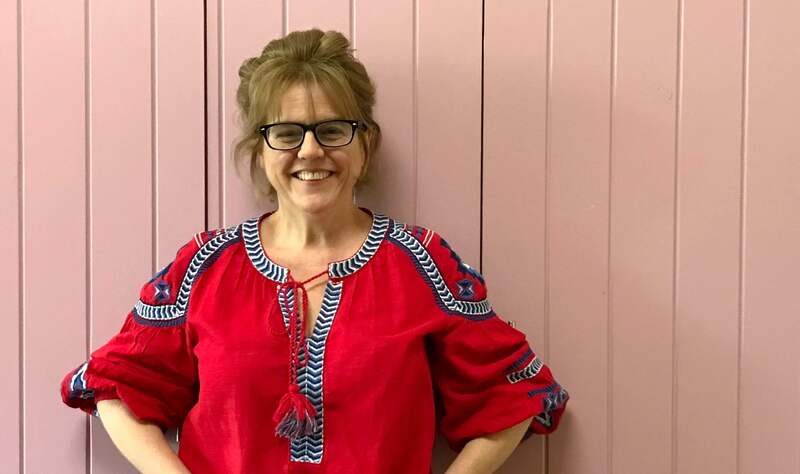 Mental health campaigner and Fabster Rachel Kelly discusses the relationship between food and mood in her new book, "The Happy Kitchen". Above: Writer and mental health campaigner, Rachel Kelly. Writer and mental health campaigner Rachel Kelly is on a mission to teach the world about how the food you eat can affect your mood. Learning from her personal experience with depression — she suffered two major life-defining, depressive episodes in her early thirties —and her subsequent journey to recovery, the former Times journalist, wife and mother of 5 children, has written 3 books describing her personal experiences with mental illness and the toolkit of strategies she developed to regain control of her mental health. 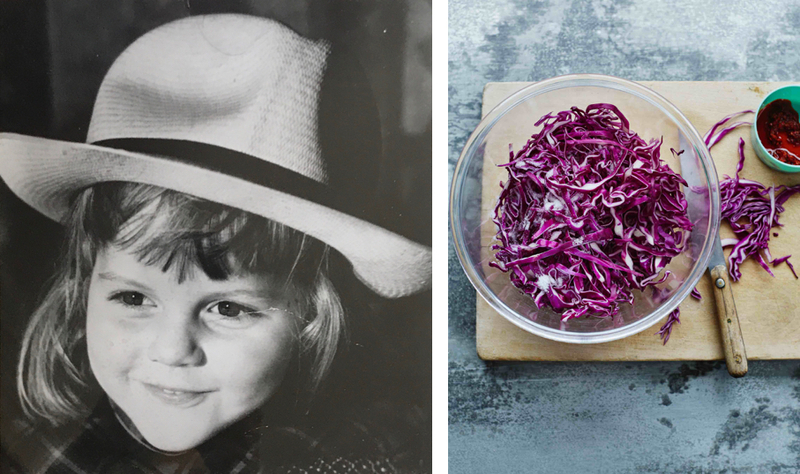 Rachel’s most recent book The Happy Kitchen is the culmination of her work with nutritional therapist Alice Mackintosh. The pair worked 5 years together to develop recipes that boost energy, relieve low mood, ease an anxious mind, support hormone balance and aid in sound sleep. 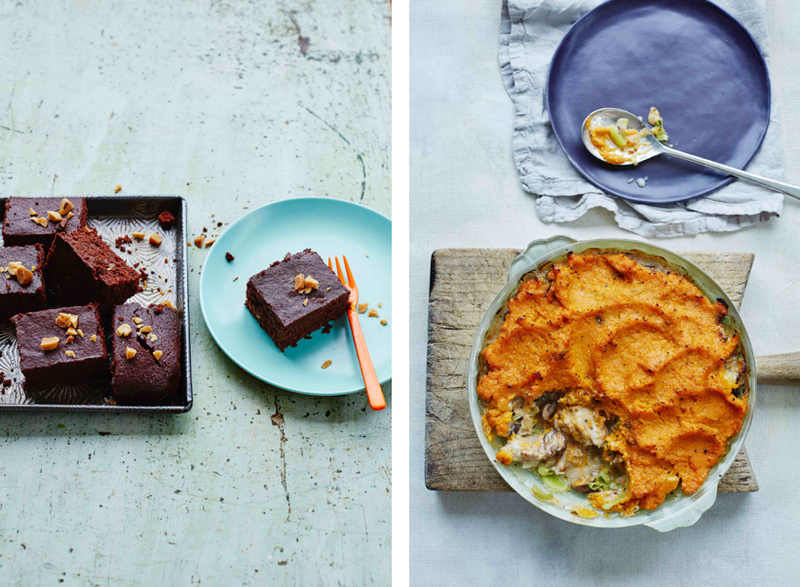 Working with the evidence from one hundred and fifty research studies, the recipes are delicious, easy to follow and they work. How do we know? The Happy Kitchen has been in our house for six months and in that time, the recipes have become an integral part of our meal planning. 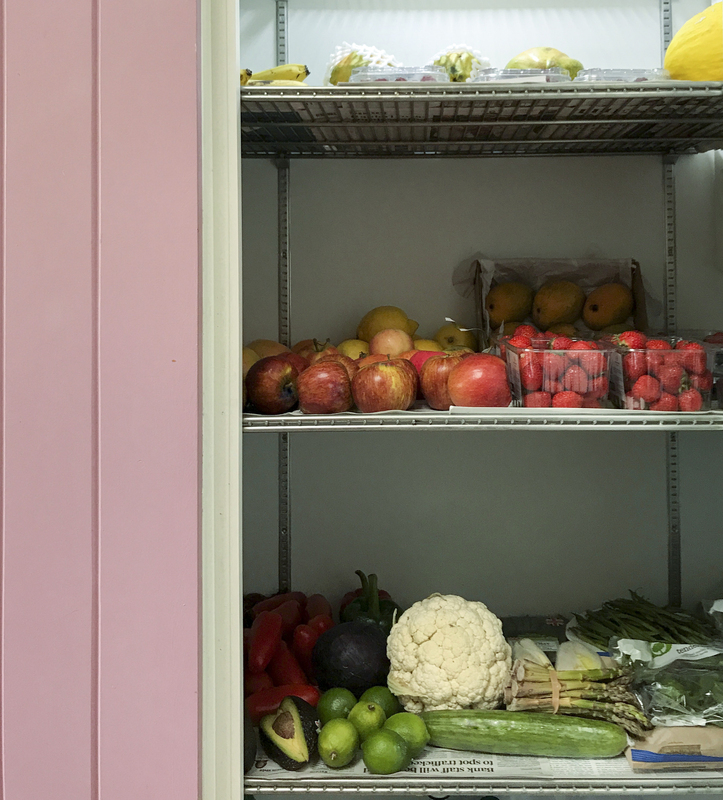 We recently caught up with Rachel in her happy kitchen to discuss how her concerns for mental health drive her passion for nutrition and its power to heal mental illness. N.B. : Be sure to check out Rachel and Alice’s delicious Dark Chocolate Brazil Nut Brownies recipe — the ultimate comfort food to improve your mood. Fabulous Fabsters: Staying strong and well in body and mind is critical to your well being. Please explain. Rachel Kelly: It’s interesting. I used to think of the mind and body as separate entities. And then I had this light bulb moment when I realised that not only were the two connected but that their connection was indissoluble. More and more people are beginning to understand this and it’s changing the way we view mental health. People are now looking at whole body systems comprehensively. For example one potential explanation for poor mental health is that low levels of chronic inflammation throughout the body can affect both the mind and the stomach. So this indissoluble connection is a very exciting concept. If you’re feeling low, it’s all very well to say “snap out of it”. But sometimes you just can’t just change your negative thoughts. You can however change what’s going on with your body and if you approach the low mood physically, you can have a direct affect on your mental state. If you can learn to be more physically relaxed, you’re automatically mentally relaxed. And vice versa. If you’re mentally tense, you’re physically tense. This insight underlies a lot of the strategies that I have developed for myself to cope with mental illness. 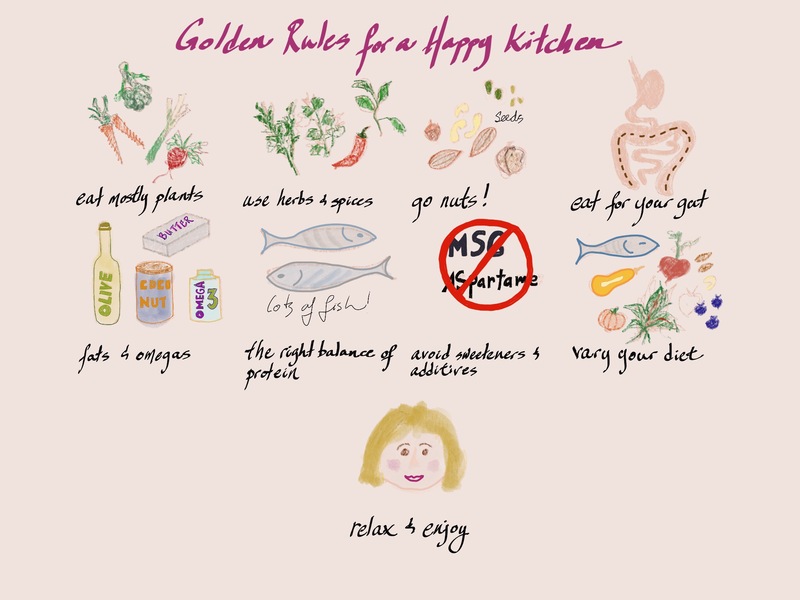 Above: “Following the Golden Rules I set up with Alice and the recipes from The Happy Kitchen along with my other well-established strategies have enabled me to regain the peace of mind that my illness once stripped away,” Rachel says. Artwork by Christine Chang Hanway. FF: What are the tools in your toolkit? RK: There are two types, psychological and physical. Psychological approaches include therapy, meditation, poetry and gratitude exercises. Learning to think in a grateful way has been very helpful. And with physical approaches, I think I first started with breathing exercises. One of the big characteristics of worrying and anxiety is that essentially you’re not in the moment. You’re either worried about the future or the past; you’re not here and you’re certainly not focused on the present. But if you think about breathing while you inhale and exhale, you can’t really breathe in the future or the past. So learning a few breathing exercises is would be a good place to start. Exercise is another important physical strategy. What’s most interesting here is just how many bodily processes exercise affects. We all know about the endorphin high but in fact, exercise affects many more systems in your body —the endocrine system, the digestive system, the muscular skeletal system — it affects us in so many positive ways. And then of course, there’s nutrition! 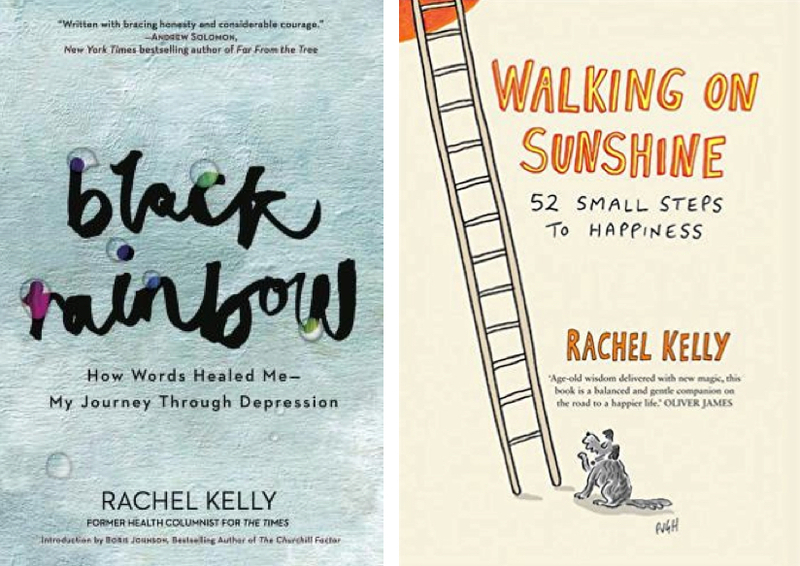 Above L & R: In her two previous books Black Rainbow and Walking On Sunshine, Rachel shares the coping mechanisms she developed to regain control of her own mental health. FF: Why do you feel it’s important to have nutrition in your toolkit? RK: Because food is the one tool where you can have an enormous amount of control. In one day, you have about 7-8 chances to make a good decision. With all of these strategies, there is the potential to fall off the bandwagon — fail to show up at an exercise class or not do your breathing exercises, for instance. The thing about nutritional interventions is that you have to eat — that’s a constant. Even if you have 5 croissants for breakfast, another chance to made a good decision is not far away. You can have a really good lunch and get back on track. 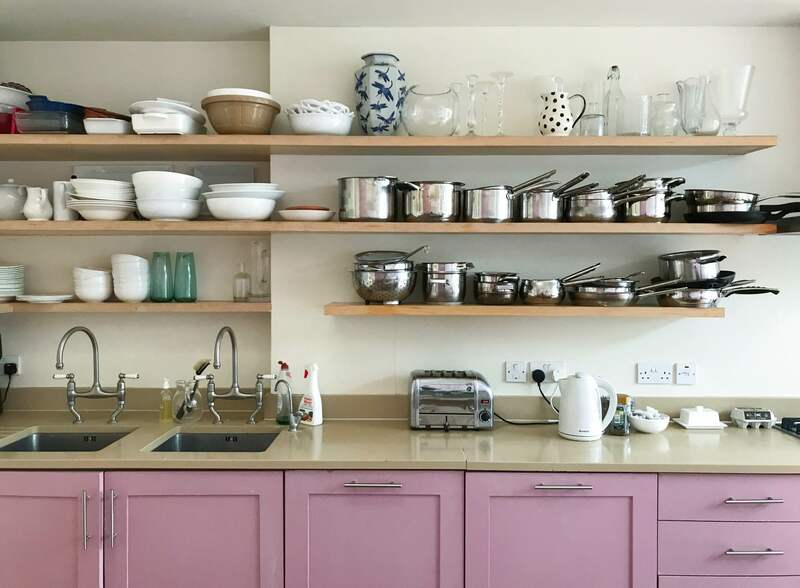 Above:A well stocked larder and pantry makes it easier to eat well. So that’s the first reason why nutrition has become so big in my life. The second reason is that the kind of changes you can see with nutritional interventions are incredibly quick. And by interventions, I mean cutting out the CRAP — Carbonated drinks, Refined sugars, Aspartame and additives and Processed meats and foods — while taking Omega 3 supplements and increasing your intake of probiotics and prebiotics to improve your digestive health. There is really good compelling evidence about the benefits of oily fish and healthy fats. It makes sense because our brains are sixty percent fat. If you cut the CRAP, you can begin to see changes in one day and within 4-6 days of changing the microbiomes of your digestive health, you can see even more improvements. It’s very exciting when you can make a difference so quickly. The best antidepressants can take up to 2 weeks to start working. I think that nutrition is going to be very big in the future. 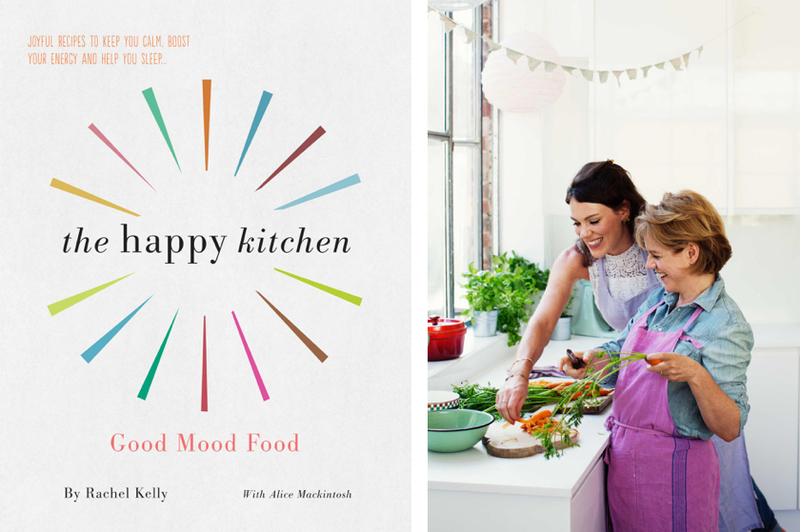 Above L: The cover of Rachel Kelly’s The Happy Kitchen, co-written with nutritional therapist Alice Mackintosh. Above R: Rachel and Alice test some recipes. Photography by Laura Edwards. 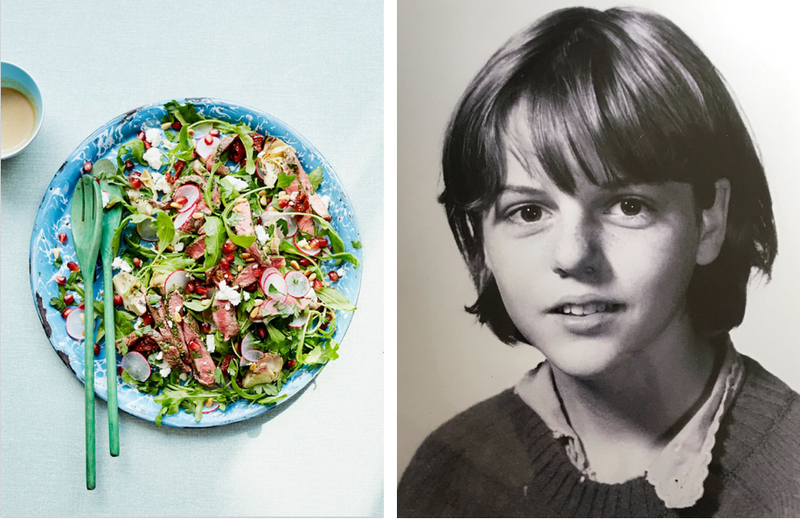 FF: How does The Happy Kitchen differ from other healthy eating books? RK: In my journey to get better, I discovered that nutrition could have a positive effect on my mental health and I wanted to know more. The big motivation for writing The Happy Kitchen was that I couldn’t find a book which connected food to mood. FF: Tell us about the mental health charities you work with? What do you do? RK: I am an ambassador for Sane, Rethink Mental Illness, Young Minds and vice-president of United Response. I also volunteer at our local prison in Wormwood Scrubs although I don’t do nutrition with them because I can’t affect their diet. In my journey to regaining my mental health, I have been fortunate to be able to work with nutritionists, psychiatrists, therapists, scientists, and psychologists. And now I want to share what I have learned and work to reduce the stigma and improve the treatment for those suffering from mental illnesses and I do this through running workshops alongside the various mental health charities. I see myself as a conduit to some of this new information about what can make a difference and making the new studies accessible. Good mood food is a huge and growing field. Above: With depression as the leading cause of ill health and disability around the world, can we afford to spend this little on mental health research? Diagram via Transforming Mental Health Through Research. FF: Why is campaigning for mental health so important to you? According to the World Health Organisation, depression is the leading cause of ill health and disability in the world. It’s overtaken lower respiratory disease as the biggest global health problem with over 300 million people worldwide having a diagnosis of depression, an increase of 18 percent between 2006 – 2015. 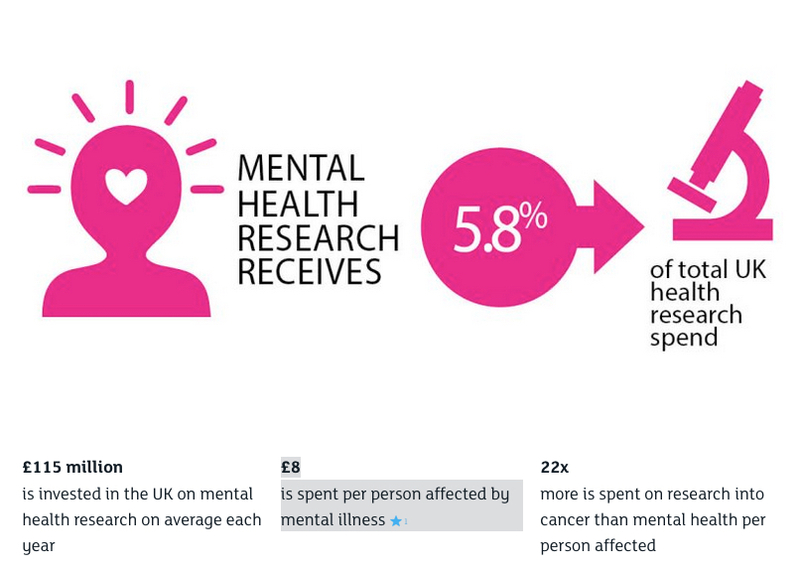 And according to Transforming Mental Health Through Research, mental health research receives 5.8% of the total UK health research spend. This problem is not going away and carries a huge human and social cost. I campaign to raise awareness of this critical issue. 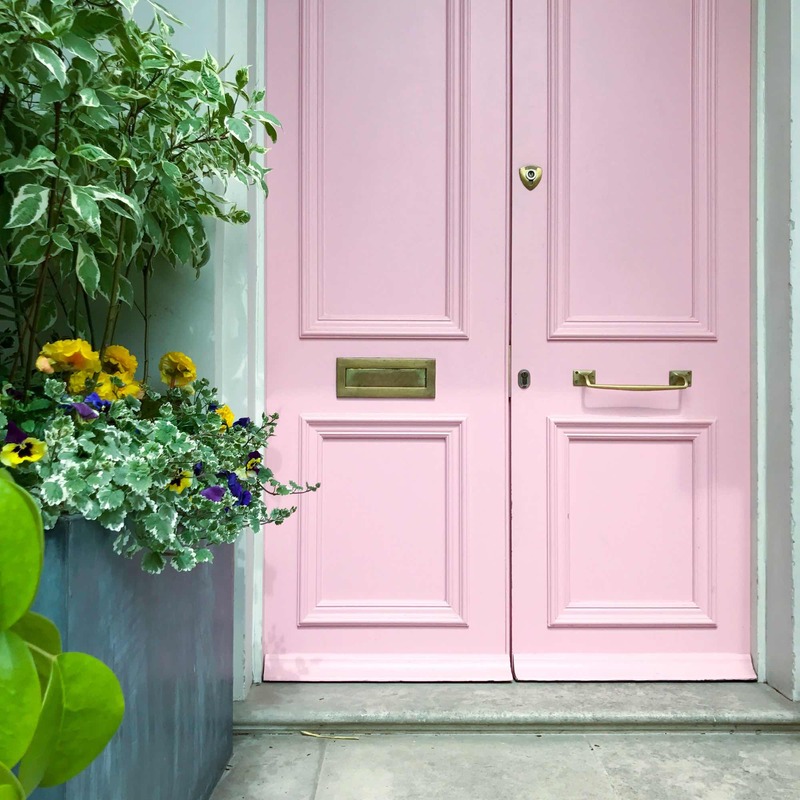 FF: What is your key message to anyone suffering from mental health? RK: Mental health is an illness like anything else and there is no shame in it. It is complicated and nuanced and we are all different. I do think thought that some of the interventions are quite simple and most importantly, you can do them yourself. My key message is this idea that you can take some charge of your own mental health. And why not? This has got to be our future. We got lulled into the sense that pills were going to sort us all out and it’s now time to be proactive and take responsibility for our own health. And just like our physical health, there are proactive steps we can take for our mental health. FF: Does your toolkit exclude medication? RK: I am not saying that I am against medication. Interestingly studies are now showing that medication works more effectively when taken in conjunction with practising these other interventions. And some psychiatrists are now explaining this to their patients when they prescribe them medication. The problem with medication that is you are dependent on it and someone else to prescribe it for you. For instance, you can’t change your medication without getting an appointment. That’s quite difficult to manage with the long waits at the NHS. Equally with therapy, you have to rely on going to see someone. The less control you have, the more overwhelmed you can feel. RK: I feel that this post-intense raising a family period can be very positive for us. I’m having the time of my life. I have never felt calmer or happier or able to be creative. And I see it around in many of my girlfriends. I think people feel very negatively about menopause but actually it can be an amazing time. It’s important to realise that it’s not all over in your fifties. This can affect how you play your twenties, thirties and forties. Don’t be in such a rush to race ahead with your career. Enjoy the other things in your life like raising your children. You will have more chances later — I wish someone had said this to me. 1.Preheat the oven to 190C. Grease a 30cm x 20cm brownie tin and line it with baking parchment. Leave the paper sticking up at the sides to make it easier to lift the brownies out when they are cooked. and vanilla seeds or extract in a saucepan over a very gentle heat, stirring regularly, until everything has melted and you havea rich, glossy-looking batter. 6. Pour the mixture into the prepared tin and bake it in the oven for about 12 minutes. Insert a cocktail stick and it should come out with a little chocolate residue. If you like your brownies less gooey, put the tin back in the oven for a further 3-5minutes but take it out before the top starts to crack, otherwise the consistency will be more like cake. A Fabulous Fabster thank you to Rachel Kelly! Wonderfully designed and presented (I especially like Christine’s interpretation of the Golden Rules). Encouraging that nutritional intervention can make a difference so quickly.